Home > FLEX XC3401 VRG Dual Action 6.5 inch Pad Kit - Choose Your Pads! 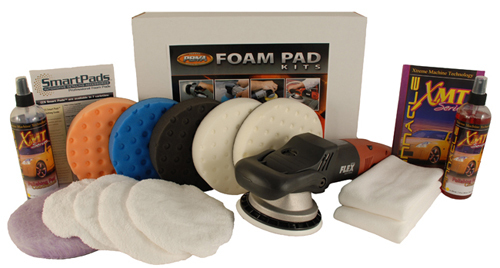 Receive ADDED BONUS, Flex Bag and Lake Country Red 6.5 CCS Pad with your purchase of this FLEX XC 3401 Polisher kit! Super soft and absorbent, these 70/30 towels are perfect for buffing off waxes, polishes or sealants. Tiny looped fibers polish your paint to a beautiful shine while the woven core absorbs an incredible amount of fluid. These towels have an amazing "grip" to remove even the most stubborn wax residues. Microfiber construction eliminates the risk of micro-marring. Coarse Green Cutting/Polishing Foam 6.5"- This foam is of medium density with the ability to level very fine scratches and very light oxidation. Use light swirl removers with this pad. Blue Finessing Foam 6.5” – Flat pad has soft composition for applying glaze, finishing polish, sealants, and liquid waxes. Flat pad provides full contact with paint surface to minimize the pressure applied by the user. You can’t beat the value on this FLEX XC3401 VRG Dual Action 6.5 inch Pad Kit. The FLEX XC3401 is a ruggedly built machine that will give you many years of service. Lake Country sets the standard for hook and loop foam pads with their durable foam compositions and unique foamed wool pad. With the premium Cobra microfiber towels and Pinnacle pad care products, you’re looking at an excellent opportunity to step up your detailing skills with a fantastic machine. You’ll love the way this polisher handles and, of course, you’ll love your results. A total retail value of $460.88. Save $70.89!